The Dr. Lippisch was a pioneer in the development of delta winged aircraft and his work eventually led to the XF-92, F-102, F-106 and B-58 in the US and the Mirage III, IV, and V in France. The P.13a was one of his initial designs, so you could say this is the granddaddy of all those other aircraft. It was supposed to be a ramjet fighter, thus the rather unusual intake and exhaust design. Now a ramjet requires a rather high rate of speed before it starts to operate, so there needs to be some way of getting your craft up to those velocities in order for the ramjet to kick in. One can assume from the lack of landing gear that this fighter would have been launched via a rocket, and there is a small nozzle just above the main exhaust for that rocket. On assumes that the ground handling trolley would have been used for take off and then jettisoned at take-off in a similar manner as early Ar-234s and for all Me-163s. Ramjets are also rather thirsty creatures so much of the airframe would have been full of fuel for both the launch rocket and for the operation of the ramjet itself. Crashing this vehicle when fully loaded with fuel would not have been a very safe thing to do! Fortunately for the pilots of this plane, it never left the drawing board, although there was a glider, the DM-1 that was highly successful. Huma makes a 1/72 kit of that aircraft if you are interested. It seems as if this is a brand new mold, which is a good thing. As you can see, there really isn't that much to the kit. Only 11 parts in total which should make for a quick build. 4 of those are for the ground handling trolley. The cockpit is a bit on the bare side with the seat bottom molded in place. A stick and seat back are the only other items provided for the interior. The canopy is well molded, thought the clear is a bit distorted (not a problem when one has such a basic interior. There is also what appears to be a mold seam that needs sanded off. PM have done a great job in molding it to protect it from damage in the bag as their clear is a bit more brittle than others. The actual molding of the kit is quite well done. What few panel lines there are are engraved into the slightly pebbly finish of the plastic. Only on the forward wheel assembly of the handling trolley are there any ejector pin marks. Likewise the frame of the trolley itself is the only part that has any sink areas, as you can clearly see in the image above. Both will be quite easy to fix. The aircraft is supposed to be armed but no gun ports are molded in the plastic so the builder will have to drill those out. It should be easy to 'trick out' the cockpit using parts from the spares bin. Instructions are more than adequate for this kit, especially due to the dearth of parts. A full painting guide is provided for the exterior of the model. The insides, of course, should be painted in RLM 66 dark grey. The only paint scheme given is for the box art plane in RLM 81/82/65. I doubt if RLM65 would have been used this late in the war, but this is Luft '46 and rules of painting are only to be loosely obeyed! 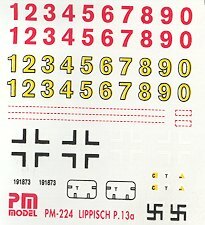 The decal sheet provides a lot of numbers, insignia, side hatches and some warning stripes. Decals are very glossy and the printing is a bit smudged on some of the bits so you may want to scrounge the spares bin for replacements. I constantly hear people moan about the lack of good, inexpensive kits. Well, this is one that you'll like. It is inexpensive, and seems to be easy enough for the bare beginner, yet provide a basis for detailing that the more advanced modeler will like. Another thing is that it is a neat subject. While other companies seem to have shied away from Luft 46 subjects, PM has filled in for them with this and the previous Me P.1111 that was released last year. Efforts like that need to be supported. If ever there was a weekend project, then this is it!